In the editor, you can easily replace one object by another while keeping its position, its properties, timing and even its animation settings. To do that, first make sure you have the new object available in your Library. If the new object is, for example, a picture, make sure you've uploaded it to your Personal Library. On the Stage, Select the object you want to replace. You will see its Properties in the top right area of the Editor. Open the "Swap Object" panel by clicking the "+" icon. Next, drag your new object from the library and drop it in the dashed object placeholder. That's all! 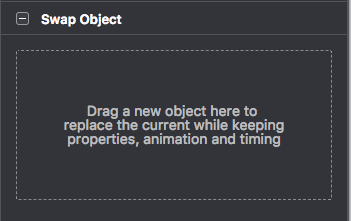 Now your new object has replaced the original one and has taken over its position, properties, timing and animations, except for special animations that are object-specific.